Rahul Gandhi has also accused the RSS of creating unrest in the Northeast. 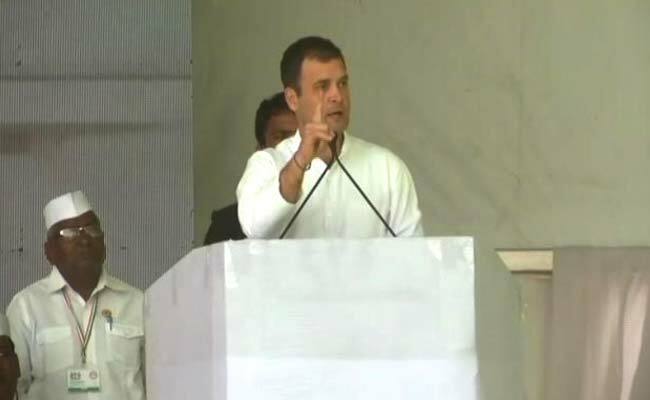 Congress president Rahul Gandhi launched a scathing attack on the RSS today, alleging that its members wield clubs and spread hatred. Addressing a meeting of the Congress Seva Dal, Mr Gandhi asked Congress men to counter the hatred spread by the BJP and its ideological fountainhead Rashtriya Swayamsevak Sangh (RSS) with love. Mr Gandhi also accused the RSS of creating unrest in the Northeast. Targeting PM Narendra Modi, Mr Gandhi said, "He runs the country for a select group of 15-20 people." "For PM Modi, India is a "product" and he wants to divide its benefits among his "15-20 friends", but for the Congress, it is like a sea which has space for all, he said. "Modi gives tall speeches, says nothing happened (in the country) in the past 70 years. That means Mahatma Gandhi, Sardar (Vallabhbhai) Patel, Jawaharlal Nehru, (B R) Ambedkar and all chief ministers, people of the country, farmers, labours and small traders did nothing. It is an insult of every citizen," Mr Gandhi said. The erstwhile Congress government introduced rural job guarantee scheme MGNREGA and "we are waiving farmers'' loans but PM Modi makes empty promises to farmers and loans worth Rs 3.5 lakh crore of his friends are written off," he said. The RSS-BJP hold fear inside them, which is reflected in the hatred they spread. The Congress president said when he hugged the prime minister in Parliament, PM Modi hated him for the act. Mr Gandhi said the Britishers banned Seva Dal in 1927 and that Mahatma Gandhi, Sardar Patel, Subhas Chandra Bose were jailed for years but none sought apology from Britishers, except for V D Savarkar, who sought apology for nine times. The two-day ''adhiveshan'' of the Seva Dal was organised after 30 years.